It could shed light on the mysterious culture of the ancient Etruscans. Archaeologists in Italy have just made a tremendous discovery of an ancient sacred text in the Etruscan language. The discovery could tell us details about what kind of god or goddess Etruscans worshipped. The text is written on a huge sandstone slab embedded int he foundations of an Italian temple that had been buried for about 2,500 years, according to a Southern Methodist University statement. The slab comes in at 500 pounds and is about four feet tall by two feet wide with 70 legible letters and punctuations marks. These slabs could tell us a lot about the mysterious Etruscans who lived thousands of years ago, and whose culture we don’t know much about. The Etruscans were once the rules of Rome, and they influenced Roman culture. They were likely one of the most religious people in the world at the time. The Mugello Valley Archaeological Project has spent about 20 years digging for Etruscan artifacts indicating their worship and beliefs, as well as indications of what the daily lives were like for individuals. 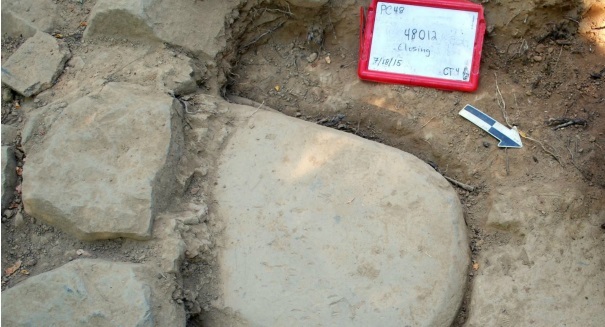 This could be a major find that could shed some light on this mysterious culture. “This is probably going to be a sacred text, and will be remarkable for telling us about the early belief system of a lost culture that is fundamental to western traditions,” archaeologist Gregory Warden, co-director and principal investigator of the Mugello Valley Archaeological Project, said in the statement.